Satoshi and I checked out the Greek Festival on Sunday. This was the first time for both of us. After paying the $3 admission, we checked out the various food booths. At 13:00 (an hour after opening time), some had "sold out" signs. The line for desserts was long. As Satoshi and I checked out what was to be had, we stood in line for souvlaki, which are kebabs. It was our first time trying ouzo, an anise alcohol which is widely consumed in Greece. We loved that it was cold, especially on the humid and hot day that Sunday was. I then left Satoshi to stand in the souvlaki line, giving him instructions as to what to get (1 pita, 1 pork & 1 beef =$9), while I hurried to stand in line at the desserts. The line for the desserts were long and as we waited, Satoshi and I ate our souvlaki, the pork and beef were tender and very flavorful, the pita bread, very soft and tasty. Still standing the dessert line, we finished the sorbet and souvlaki, then I sent Satoshi to the greek salad area to buy some dolmathes (stuffed grape leaves). By the time it was my turn to purchase some desserts, I found out that most everything on their menu had sold out the day before. Slightly in shock that most things had sold out, I picked up a melomacarona (vegan spice cookie), kourabiethes (almond butter cookie with powdered sugar) and baklava (classic walnut)--$3.75 (total). The dolmathes were on the sour side but delicious especially with the yogurt sauce and pita. The desserts were delicious, not too sweet. My favorite was the Kourabiethes because it reminded me of Russian Tea Cookies/Melting Moments. As we sat, we debated as to whether we should try the Greek beer or greek coffee. Coffee won but we were totally disappointed...I imagine drinking sweetened dirt to be something similar?? The coffee was hot, thick and murky. I bought their "Frappe" $3...but upon waiting for my drink, overheard how they made it....instant coffee, condensed milk, a little water then whip it...blah...this was an iced version of sweetened dirt. I know you shouldn't say anything if you've nothing good to say and usually don't say "bad things" on this blog, but these two items were really awful. In the end, we tried their Greek beer, Hillas...$6, a light lager beer. Really refreshing on a hot day. All in all, we spent close to $40, it was still a good experience. And for the most part, we enjoyed the food we tried. I hope this festival continues, I've heard that this may be the last year as the "aunties" preparing the food are getting up there in years. Before leaving the town area, we checked out Satoshi's favorite view spot from Puu Ualakaa Park. 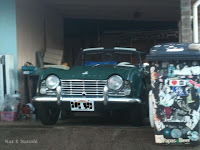 In Japan most of the cars you see are "newer" due to their laws and higher taxes for older models. 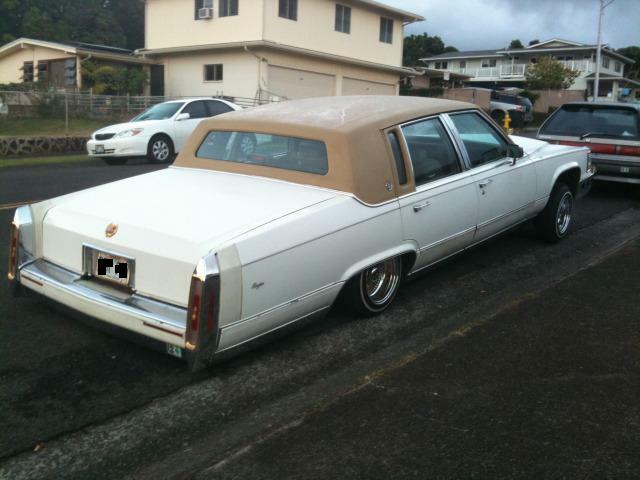 So, I love how many different types of cars you see around Hawaii. Vintage types, like this station wagon. I think the bright yellow one next to it is something vintage also. 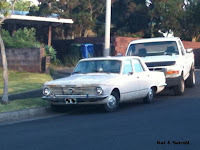 I think this is a Plymouth Valiant. Any interesting vehicles where you live? Got together with Wen and Steph for high tea at The Veranda. We were seated looking out at the ocean, it was really nice. The waiter brought out their selection of teas and let us smell each one as he explained them. I chose a white tea that was infused with peach. Loved the aroma of this. We were also served a cup of white bean and garlic soup. I liked this because it wasn't overly garlicky. 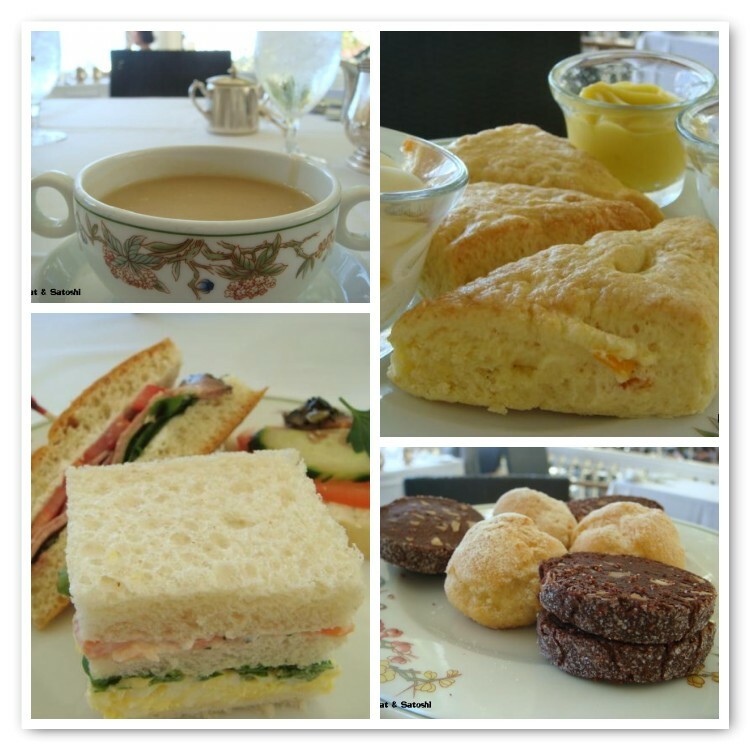 Then came the finger sandwiches--can't remember what he said but they were all very good! Chocolate Macadamia cookies and cream puffs--wished they had filled the cream puffs with custard instead of whipped pastry cream. Mango scones with devonshire cream and mango curd....mmm! Mango cake with a rich mango sauce and fruit tart...I liked the mango cake over the tart. Lemongrass sorbet to cleanse the palate. It was a gorgeous day, lots of chatting...perfect to share with friends. 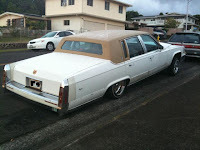 The lunch wagon is not something new in Hawaii. Recently though, there are taco trucks popping up here and there. I think I mentioned that I had planned to check out one with Deb, but since that one was out of business (or so it seems on Twitter), we instead planned to check out one called T.A.S.T.E. Anyway, this truck has 5 regular items on the menu and a daily special (unfortunately at 11:30 am the special was already sold out!). Each taco is either $2.75 or $3.25 and served with a nice amount of slaw on top, (which does not make them too blog photo friendly (because they all look alike)). Deb and I ordered 2 each and shared. Shrimp with wasabi honey mayo& wafu (Japanese style) dressing ($3.25)--loved the sauce but thought the shrimp should've been marinated or something. Homemade charsiu with shoyu aioli & Hoisin vinaigrette ($2.75)--nice 5-spice taste, very meaty. Just the right amount for lunch. A bit messy, definitely not something to eat while driving around. I would definitely go back, these tacos are reasonable (by Hawaii standards) and very tasty. Wanting something a little sweet after lunch, Deb introduced me to Cake Works. They mainly specialize in wedding and celebration cakes, but do have lots of other goodies there too. Another nice thing was that they also had a little eating area right in front of the shop. So moist and delicious, even with it being in the refrigerated case! The red velvet had cream cheese frosting and the peanut butter frosting was so light and creamy. I would definitely go back for some sweet treats! It was nice to see Deb again and to try two new places. Satoshi is coming soon so there will definitely be more eating for another week or so. MIL was supposed to come too but decided not to, it's too bad because everyone was looking forward to seeing her. Pondering what to post about...hope to come back with something soon. It's been awhile since we had a daydream. Here's a daydream spotted in the early evening when we usually get a sprinkling...it is actually a double rainbow, click on the photo to see it up close. This is what happens when you dig a hole and throw in a pile of seeds from your morning papaya. We need to weed out some of the seedlings but are excited to see what kind of papaya we will get. Check back in 2 years. UPDATE: After my grandma, who is the expert "farmer" in our family, saw my bazillion papaya seedlings all clumped together, she dug them up immediately and planted one in each of these 4 pots. On another note...remember that bunny? Well, in the past couple of weeks it escaped and then was found. 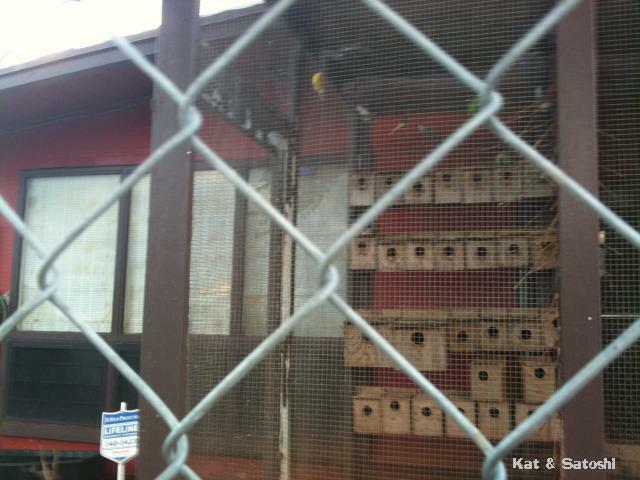 His owners put him into their parakeet cage where he was separated from the rest of his friends. 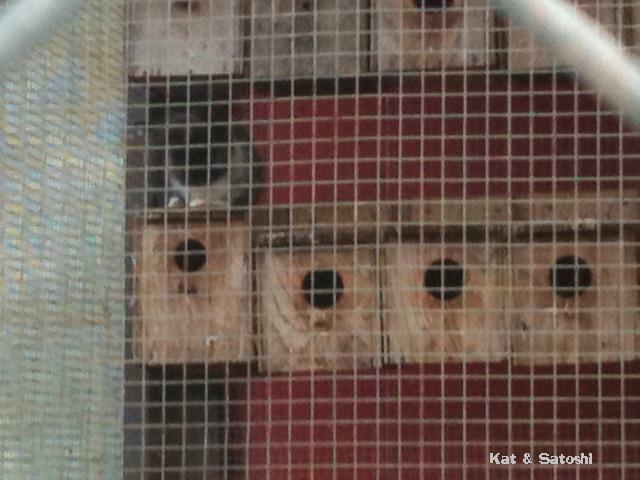 The exiled bunny was recently spotted a couple feet up on top of the parakeet's birdhouses inside the parakeet cage (can bunnies fly??!). I love walking past this house, you just never know what you will see. Checked out Big Kahuna Pizza with Wen. We slipped in just before a huge lunch crowd and shared their garlic cheese balls. These are buttery, garlicky, cheesy...yum! I thought I had never eaten them before, but realized I had tried them so many moons ago that I had forgotten. We also shared a 7-inch Sumo Special which I've written up about here. This was still delicious as ever. And to make us feel special, the guy at the counter gave us 3 chocolate mac nut cookies to share. We didn't order them and I noticed he passed them out to a couple of tables with no explanation as to why. They tasted like they were freshly baked with the chocolate kinda melty and whole pieces of roasted macadamia nuts. Totally full it was another great foodie day with a great friend. I met up with some former co-workers in Waikiki the other day. 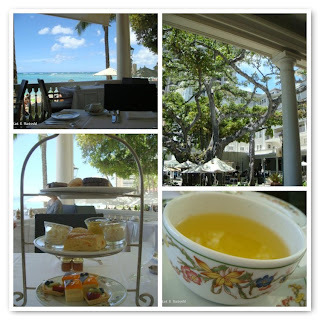 My mom had a lunch with her friends near Punahou, so I walked to Waikiki from there. I loved the looks of the King Kalakaua Building, it had a kinda retro feel to it. Saw this Chevy Impala (I think) at an Auto Body shop. Oohed at the carved reliefs on the new Allure Waikiki (where I think Wave Waikiki used to be). I think these fixtures must look nice all lit up at night. Was kind of sad to see that Nick's Fishmarket had closed down, took a picture of the sign for posterity. And they were cutting down all these palms. 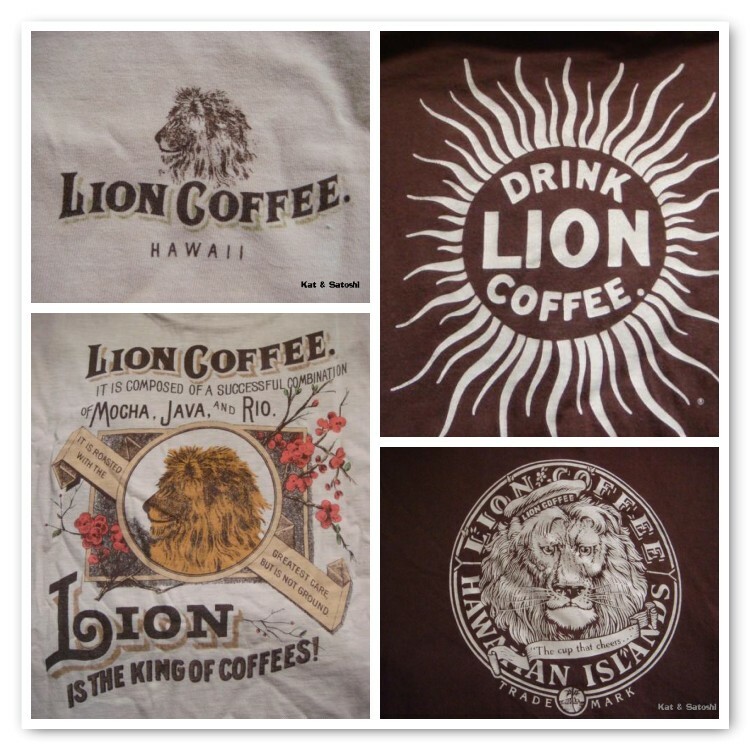 I checked out 88 Tees which the Japanese tourists seem to adore. Lunch was at Atlantis Seafood and Steak...their seafood pasta (which I took after eating most of the seafood). Before I caught the bus back to Beretania to meet up with my mom, I bought myself a small iced coffee from the Peet's cart in the Sheraton Waikiki. I really like Peet's coffee and always buy a bag to take back with me. Not too sure how I came to love them but do remember getting a bag of their roasted coffee in a paper sack way back when. Nice walk, nice catch-up with friends and despite the blisters on my feet, an overall nice day. Been wanting to share Cake Couture with my friend Wen for some time now, so we headed out and tried them. Our crazy plan was to halve what we bought and share. Wen chose Chocolate, Key Lime & Coconut and Peanut Butter. I chose Rocky Road, Orange Creamsicle and Chocolate Cherry. 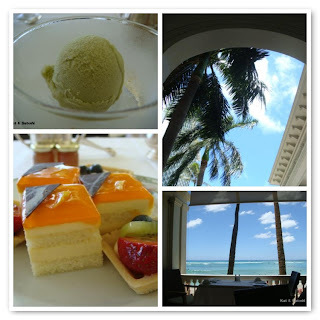 We loved Key Lime & Coconut. The white cake was very moist, the lime was very subtle and there was lots of shredded coconut on top. Orange Creamsicle...meh, the frosting was hard, so was the cake and only a little orange flavor. Chocolate, Rocky Road, Chocolate Cherry & Peanut Butter had all the same chocolate bottoms, which were surprisingly disappointing, dry and flavorless...boo! On the upside, we did enjoy the chocolate cherry frosting with a punch of cherry flavor and bits of cherry and the peanut butter frosting which was like eating whipped peanut butter. Major sugar rush, lots of water, some disappointment but all in all good times and moral of the story...don't let your eyes be bigger than your sugar tolerance level, just choose 4 (max! or less) to share! Went to check out Hapa Grill with my blog friend Nate, Hwn Pake Okinawa. I checked out their website before going and was pleasantly surprised that they are related to Sassy Kassy's lunchwagon. When I worked out in Kapolei, we went to buy plate lunches from Sassy Kassy's a couple of times in the Campbell Industrial area. I remembered that their teriyaki items were really good....Sadly the lunchwagon closed in 2005. We both ordered the combo plate with two choices, white rice or brown or fries and mac salad or tossed....$12.75+tax each. I chose the teri beef, mochiko chicken, brown rice & mac salad. Nate chose the pork chops, teri beef, white rice & tossed salad. Thank goodness we didn't have to go back to work or something...Our orders took so long to come. I think we waited at least 20 minutes for our food. The teri beef was on the hard side, probably overdone. Nate says "it's like eating beef jerky". For me, it was tough but not beef jerky hard. Flavor-wise it was delicious and just as I remembered it...The teriyaki sauce was a little on the sweet side. The mochiko chicken seemed to be pan fried, I liked the flavor of it. Sweet and salty. Nate's pork chops were boneless and smothered in gravy. He said it was not the best he's had, just okay. All in all, I think Nate was disappointed with his meal. I was a little disappointed that the teri beef was so overdone. We both say we would go back just to try some other items. 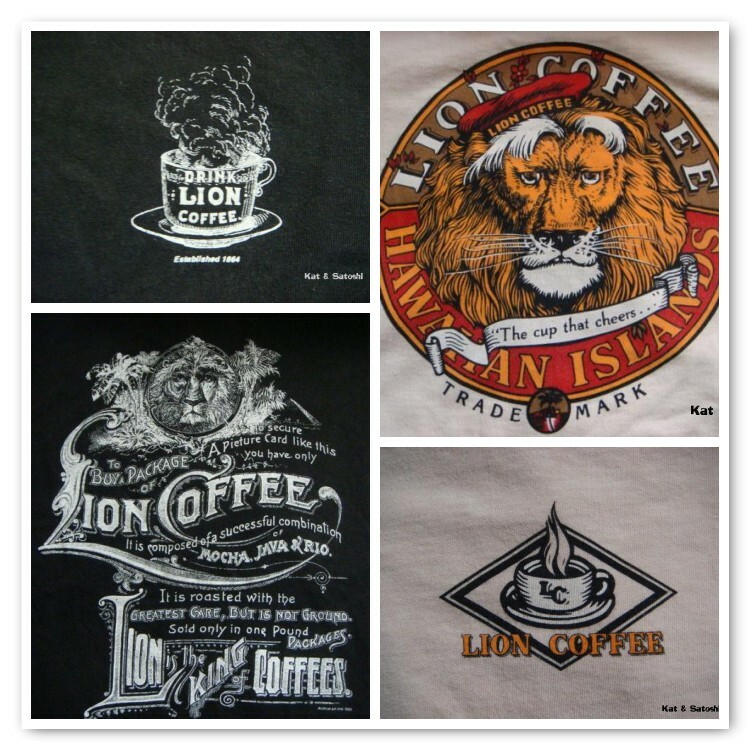 I went through my clothes the other day and didn't realize I had so many Lion Coffee T-shirts. When I worked as a demonstrator, this was my "uniform". 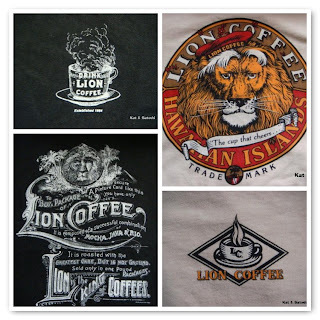 These t-shirts are thick, some were even kona coffee dyed. Since I only use them when I come home, they are still in pretty good condition. I am kinda glad that I don't demonstrate anymore though, it was hard on the feet and back, having to stand up for about 4 hours every time. Plus, lugging all that equipment everywhere in my little 2-door Honda Civic. I was also sad to hear that my former boss, Jim Delano had passed away earlier this year...too young! All in all, it was a great experience for me. I worked as a demonstrator to "work through" my fear of speaking in front of people. Though I still feel that I probably wouldn't be able to give a speech in front of a crowd. With the job though you get to meet all sorts of people, see all sorts of personalities. Stopped in at Liliha Bakery and picked up these 3 cream puffs. The green tea version was nice, though it probably could have used more green tea flavor in the cream filling. I liked how they use the same chantilly frosting (tinted green) on top with the addition of macadamia nuts. The original cocoa puff...filled with chocolate pudding and topped with chantilly. The chantilly seemed a bit salty this day. And the mini cream puff, though I thought that it might be a mini eclair. Vanilla pudding and chocolate on top. No sharing involved....just one sugar rush! and some Starbucks iced coffee straight up. p.s. to the guys at Starbucks Hawaii...please make your iced drinks in short sizes! As you walk through our neighborhood, you can see these plants hanging from trees called "Pele's hair". Pele is the Hawaiian goddess of fire and dance. If you've seen portraits of Pele, you'll notice that her hair looks something like this plant. This plant is also called Spanish moss and can be found in the Southern part of the mainland. I think I've seen this in some movies involving swamps too. Anyway, I think you just hang a piece of the moss onto a wire or string and it starts growing. 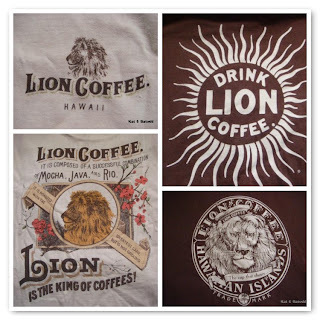 In Hawaii, some use it in making lei or as ornamental decorations. Kinda cool, don't you think?